Rihanna is back in Barbados and arrived just in time to catch the last of the Crop Over festivities. She hit up Brewster’s Road Crew’s Bucket Fete with best friend Melissa. 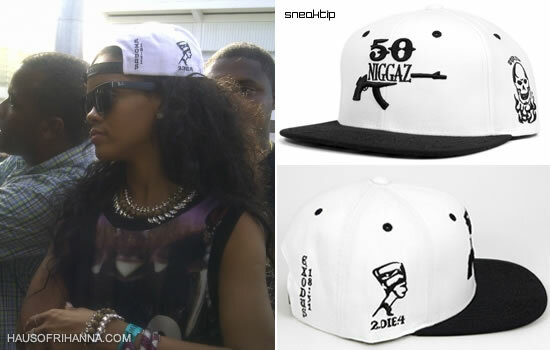 Rih wore a tank dress with a black and white snapback by Sneaktip. The Tupac inspired cap was released last year and features several of Tupac’s tattoos. She also wore her favourite Nike x Kanye West Air Yeezy II sneakers.